I wanted to share with you a few of the beautiful gifts I received from some very dear friends. 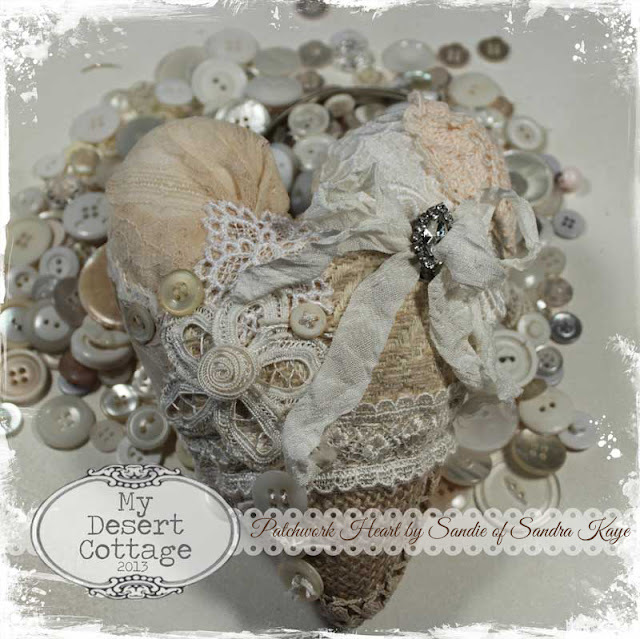 This lovely heart was made by my friend Sandie from Sandra Kaye. My taste and Sandie's taste run in two different directions, so when she gave me the beautiful patchwork heart that was taylor made for me and my style, well... let's just say... I loved it! Everything was completely hand sewn and I can see all the time that went into this. I love it and it has a place of honor in my studio. Another gift that I cherish was sent to me by Kadee of Kadee Willow. Kadee and I became friends through Blogland and she surprised me with this darling altered cigar box. Again, she totally knew what I would like! 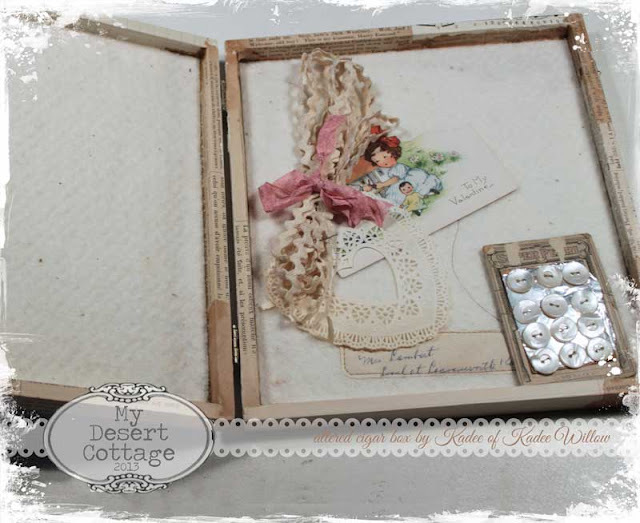 It will be perfect to fill with little treasures and ephemera. And the best part is that everytime I look at it, it will remind me of Kadee and the wonderful friendships that occur in Blogland everyday! 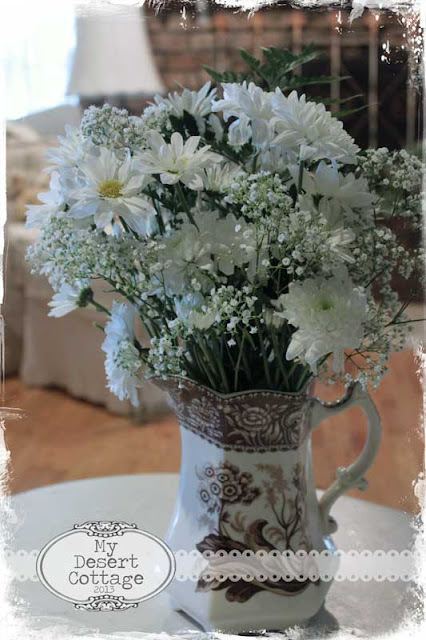 Even my hubby surprised me when he sent a giant bouquet of white flowers to the house. I guess he has learned that roses don't do it for this girl. 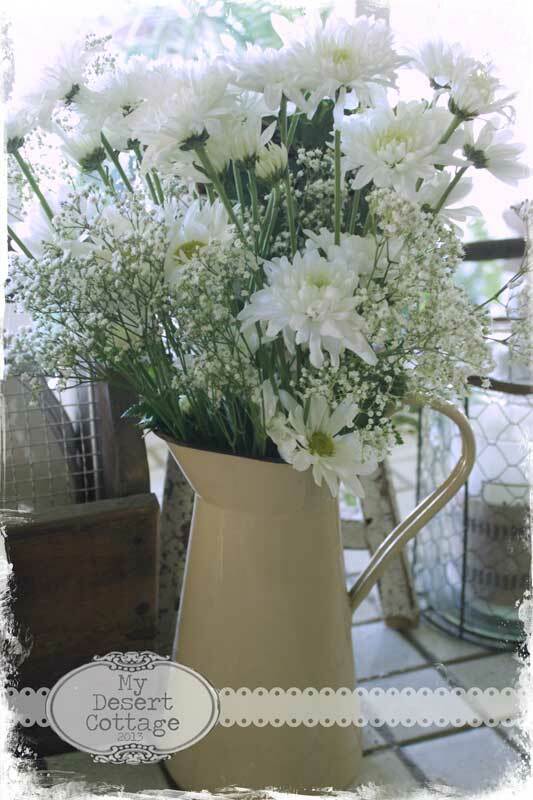 Give me fluffy daisies or wildflowers, and I am a happy girl, and if they are white... that's just icing on the cake! The bouquet was large enough for me to fill 3 vases. I also got to spend an evening with some very dear friends, and another with my son. It was a great Birthday and a great weekend. Just think... now I only have one more year to go until I become vintage myself!!!! Dejlige gaver, både hjerte og æske, og jeg vil også helst have hvide blomster, så er det faktisk ligemeget hvilken, bare de er hvide. knus morkaren. You received some lovely gifts and nice that they were made special with you in mind. Except the flowers...a sweet hubby you have. Happy Birthday!What beautiful handmade gifts! Hi Karen, congrats! What date is your birthday? Somehow I am not surprised your astrological sign is Aquarius! My birthday was on the 13th, that's why I am asking. Antique isn't soooo bad...Happy Birthday hon! Gorgeous gifts! Happy Birthday! It sounds like a delightful celebration,lucky you. 3 great birthday gifts. Lucky you. 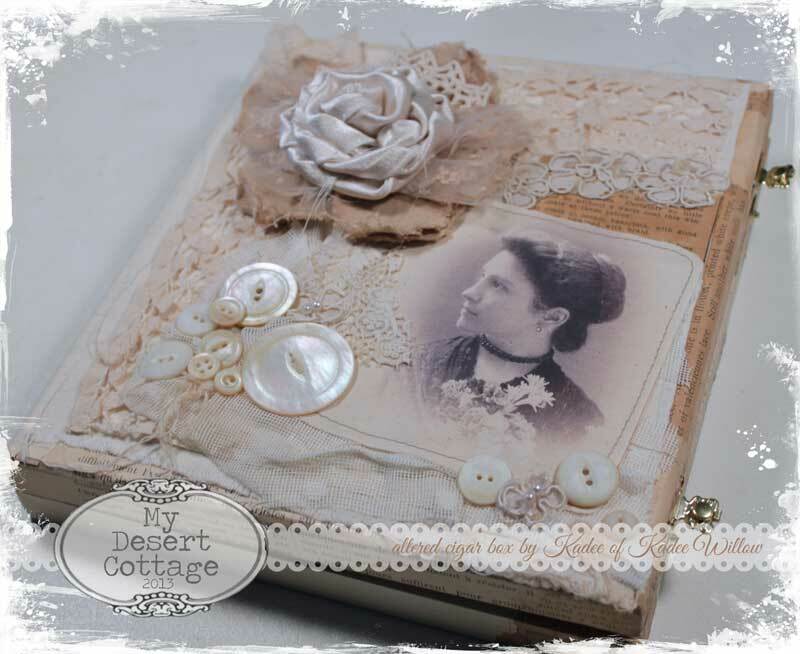 Happy Birthday Karen from a fellow Feb. Birthday girl who is Vintage but Valuable!! Ha! Sandie & Kadee did Beautiful Work! And what a good idea to send White Flowers they will go anywhere. Although I know White is your color of choice anyway! Lucky You! 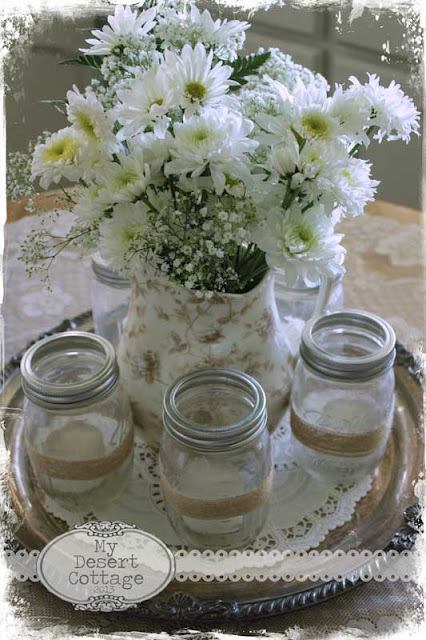 Such lovely stuff--and I adore those white flowers too! Your treasures are beautiful! Your friends are very talented and do amazing work. I really love Sandra's little heart! Your hubby sounds almost too good to be true...lol. I am thrilled he sent you the best kind of flowers....and so many! Oh happy birthday girlfriend, I'm so glad it was a good one. This was the perfect weekend for celebrating, too. Hi Karen! A belated Happy Birthday to you gal! A beautiful lady gets some beautiful things! So fitting!! Love it all and those gorgeous white flowers!! Sounds like a special day for sure. Well, my dear, if you will be vintage, then I must be antique. Happy belated birthday! Happy Belated Birthday, Dear Karen! I sure had no idea it was your b-day! Looks like you had one fabulous celebration. Adore it all and those flowers are sweet!!! Happy Belated Birthday Karen! What wonderful gifts, friends, flowers and hubby you have! Happy Birthday!!! So glad you had a wonderful birthday celebration with family and friends. Love your goodies! Oh, you got some nice goodies there!!! Happy belated birthday,Karen, and many more to come!!! So pleased you had a FAB!! birthday, love all your gifts especially your fluffy white flowers. Happy birthdaywishes from Holland. What beautifull gifts you had. Belated Happy Birthday. Your gifts are lovely! I'm so glad you loved it as much as I loved making it with your tastes in mind! It was pure joy for me! And what a gift you've given me by always being there when I am beyond frantic in a technical fog.... you're the best, Karen! So happy you know that birthdays are not just "a day" but need to be stretched out as long as you can, friend!!! Happy Birthday to you!! Enjiy your beautiful things!!! Sweet Karen- you truly did have a wonderful birthday celebration-- your gifts from friends are so very beautiful and special. They look like they were made with love just for you. Your husbands flowers are perfect!! Truly the icing on the cake! Happy Belated Birthday my friend! I am running in circles & feel so bad about being so behind. Looks like you've had a wonderful BDay. I love the brown & white transfer ware pitcher with your white flowers! He did good! Sending hugs! 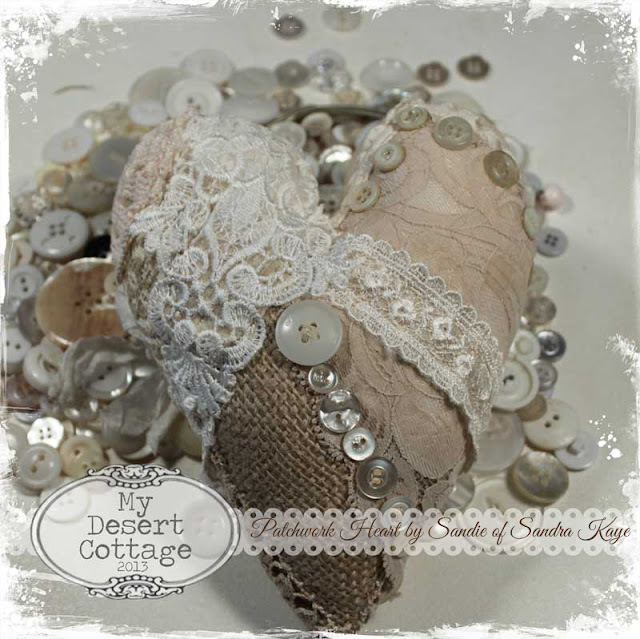 Hello my dear:):) I'm back....and I am catching up on all my blog stuff..and found the heart on your blog:):) I am very glad you loved it..it was a lot of fun to make...Hope to see ya this week:):) squish! !